The event was very long-awaited and important for the athletes, many of whom were going to prove that they are worthy to get into the national team of the country. In the weight category of 55 kg, the favorites were two sportsmen - Georgi Meboniya and Zaza Khubiashvili. So, Zaza won the competition on the right hand, and Georgi - left. 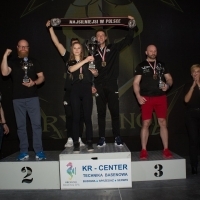 The category of 60 kg became, perhaps, the heaviest, because the sportsmen with numerous merits performed there: Alex Fretsuashvili (who was the main contender for the victory), Gela Arabuli, Merab Kakabadze and many others. Merab Kakabadze, who was on his head above all, occupied the first place on the right hand, in spite of expectations. But on the left he lost to Alex Fretsuashvili into a stubborn battle. In the category of 65 kg the main favorites - Jambul Vibliani and Vileni Gabrava - did not pull, as they already earned their tickets to the European Championships. Therefore, in this category, the youth struggled to the best. In the final duel of the 70 kg category it was hot, and the champion was one of the most talented sportsmen - Irakli Zirakishvili. Favorite 75 kg weight class Davit Samushia did not compete in this championship, so the first place on the left was taken by Betkili Oniani, the right-handed champion was Niko Tsereteli. In the 80 kg category, the youngest sportsman Valerian Meladze won the first places on both hands easily. Zaza Tabagari the same way won 85 kg. In the category of 90 kg, Irakli Gamtenadze took two of the gold medals, Bakur Toloraya became the second one, also on both hands. In the 110th champion, Giorgi Rostomashvili easily got on the right hand. For gold on the left he had a great fight with Koba Tsitilidze, who did not have a few millimeters to become the champion of Georgia. Soon Georgia will represent its national team at the main start of Europe. Will the team prolong the series of successful performances? What do you think about it?